So I don’t do enough no-bake desserts here, because I am obsessed with baking and creaming together butter, sugar and vanilla. But there are lots of people out there for whom baking is a challenge, or just not possible because there’s no oven. So my friend Anna asked me- almost a year ago!- so share some no-bake recipes. I’ve known Anna for years now- since the 12th grade, in fact- and since then, we’ve gone from confused college students to idealistic journalism grads to busy moms. Except Anna’s kind of a supermom. She has 3 kids, all spaced about 2 years apart, and she handles everything like a pro. Morning routines, the school drop, karate classes, birthday parties, you name it. And she’s the one we go to when we have any questions related to babies, toddlers, tantrums and more. I call her a supermom because in the middle of a busy day, she still has time to type out a 1000-word email when I text her and ask for advice on potty training. (I’m sorry if it makes you queasy, but bathrooms and poop become hot topics of discussion once you have kids.) She was prompt to reply to my query, but I’ve taken long enough to reply to hers. So for Anna, an easy no-bake cookie recipe. And I promise to post one more no-bake recipe before we hit Christmas! This recipe is straightforward and exceedingly simple, comes together in minutes on the stovetop. The original calls for oatmeal, I used rolled oats instead for more bite. In a heavy saucepan bring to a boil the sugar, cocoa, butter and milk. Allow the mixture to boil for a minute, then add the peanut butter, vanilla and rolled oats. On a Silpat/greased cookie sheet/sheet of waxed paper, drop teaspoonfuls of the mixture. Or use a small scoop to dollop them out in the shape of bonbons. Allow the cookies to cool and harden, and serve. 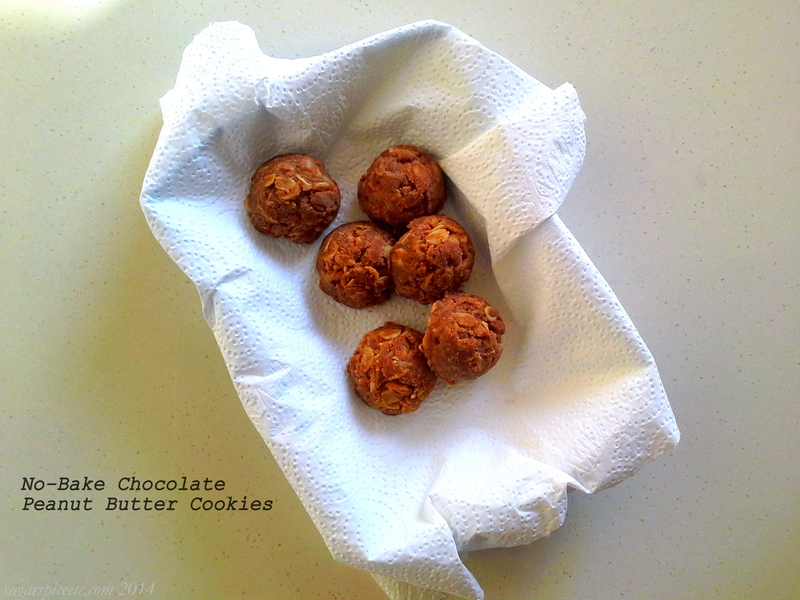 « 12 Weeks Of Christmas | Week 10: Cookie Butter!